Disney is known for their ingenuity! Now they are redefining how you will experience your theme park vacation with MyMagic+. Walt Disney World has rolled out the new MyMagic+ program which will enhance your theme park vacation and give you an extra magical vacation experience! My Disney Experience – My Disney Experience has two components – online and mobile. Online, your vacation planner can help you can create an online account at DisneyWorld.com under My Disney Experience. Here you can view your resort and dining reservations, make and change dining reservations and select your must-do’s like parades, shows, and more. While at Walt Disney World you can use the mobile app on your smartphone to see park maps, wait times, as well as your personal vacation plan. When complete you will also have the ability to update your vacation plans in real time! What’s more is that throughout your trip, you can connect and share your schedule with your friends and family too. Not sure what to do next? Using GPS information, the mobile app offers suggestions and tips on enjoyable things that can be done nearby. FastPass+ - FastPass has always been one of Disney’s greatest services! But FastPass+ will take your vacation planning to the next level! With FastPass+ your vacation planner will help you select attractions, character meet and greets, fireworks, parades and shows to visit before you ever leave home. You will reserve times to arrive at these attractions before you ever leave home. You will have the opportunity to reserve three FastPass+ reservations in one theme park for each day of your ticket before you actually arrive. But we all know how plans change, so while on vacation you will also have to ability to change your plans as needed with My Disney Experience. PRO-TIP: After you have used your first three FastPass+ selections, you can select another one at one of the kiosks located in each of the WDW parks or from your MyDisneyExperience App on your smartphone or tablet. When you've used your 4th FastPass, you’ll be able to select another, and so on, ultimately providing even more ways to customize your Walt Disney World Vacation. You can also select and use your additional FastPass+ entitlements when you hop from park to park (if you have the park hopper ticket option). MagicBand – MagicBands might look like simple bracelets but do have many more benefits. 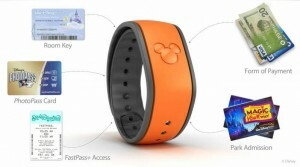 They are an all-in-one bands that will operate as a park ticket, FastPass repository, dining plan tracker, and room key. The bands are sure to be your first vacation souvenir. They are colorful, amusing and very simple to use. MagicBands are waterproof and removable bracelets that each person in your party receives that ties together all of the components of your vacation! MagicBand intends to replace traditional park tickets, paper FastPasses, and room keys that you would normally carry while in the parks. Comfort is a high priority! The MagicBands are made up of soft rubber and hence can be used again and again even for future visits. The bands are water proof so you don’t have to worry about wearing them in the pool or water parks and include ventilation too. MagicBands will come in adult and child sizes. MagicBands are going to be provided to the resort guests and can be replaced if lost or stolen. As far as the security of your personal details is concerned, you do not have to worry. This is because your MagicBand will not have any of your personal details on it. 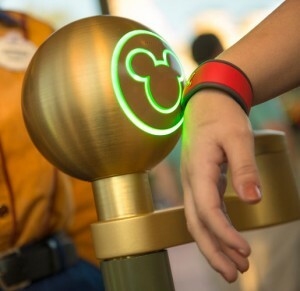 MagicBands will replace the old ticketing method at Walt Disney World. However, if a guest does not want to use this MagicBand, they can get a more traditional Key to the World card that uses RFID technology as well. On the whole, MyMagic+ aspires to make your vacation more enjoyable! But please don’t worry if all these features sound too daunting. Your vacation planner would love to help you navigate the new system.